That’s me in our local paper’s DoSavannah section, which features local music and happenings each week. Haha, jk. It’s weird though, because this is the first time I’ve really put my work out there locally. My books have been in several local bookstores, but unless someone just walked in there, they would have no idea my books exist. Anyways, this was a really cool start to the new year and as I get back on track with A New Daybreak, this really gives me motivation to press forward. I just shared the Prologue with my email list (which you should join by the way and get a free ebook) and will continue to share sneak peeks with them until release day. You can read the article here and you should probably share it on social media, because it’s 2016 people and that means it’s the future. Alright, now back to writing. That good, huh? Well, I’m doing FANTASTIC! Anyways, from 3-5 PM on October 31st, I will be hanging out at the bookstore which is located at 326 Bull St. Come stop by, pick up an autographed copy of A New Death, and just hang out with some cool book people! The first book in the Savannah Zombie Novel series is now available for both Barnes & Noble’s Nook and Kobo’s line of eReaders! A New Death is no longer Kindle-exclusive, so now more people can get in on the Savannah Zombie action! Click on the Books link above or on the links below to go to your preferred eReaders site! The rest of the series will be making its way soon! And if you can’t wait until then, don’t forget you can always buy the paperback versions! Get A New Death for FREE! 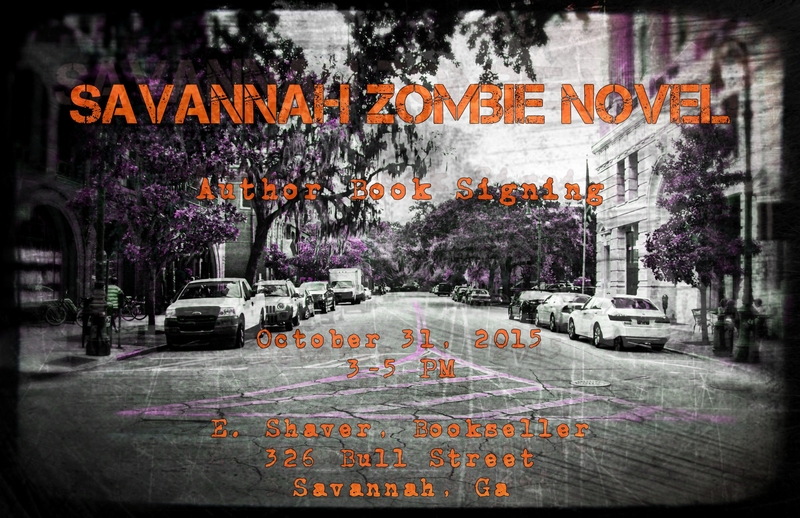 Right now you can get Book 1 in the Savannah Zombie Novel Series for FREE on your Amazon Kindle! This promo will last for FIVE days, so now would be a good time to pick it up if you haven’t read it yet! If you have, then now would be a great time to tell your friends! “I can’t believe this is the authors first book. Very well written and flowed great. You Mr. Vasquez are a gifted story teller. I really enjoyed the character development, I could not put this book down I think this is the fastest I’ve read a book.”- Jesse E.
That’s just a few people’s opinion. You can make yours by either clicking the picture above or by clicking here. We made it to the rooftop. I looked at the three others in our small ragtag group. We were exhausted, but our spirits were high. Even old man Bill had a smile on his face as he lit one of his last cigarettes. The helipad radio had fired to life only minutes ago and the voice of maybe the last helicopter pilot in the city came through it. He was willing to pick us up. We just had to wait. We crossed the city in pretty good time by my guess. Even the detour through the sewers didn’t slow us down much. It was gross, but it didn’t kill our time. The climb up to the roof of Mercy Hospital, well that was a different story. If it hadn’t been for that damn witch sitting in the middle of the hallway, we’d have been alright. Louis took the blunt of her attack, but once she was down for good, we put our medpacs together and fixed him up. It’s amazing what a little pills will do for ya. It was then I heard the first scream. One scream was met was met with another and then another, until a whole chorus of undead filled the night’s air. We didn’t have long. Thankfully, the Army left us a cache of weapons on the rooftop terrace. The city had been full of last-ditch efforts by our military to arm survivors. They may have not had the resources to evac everyone, but at least they had enough sense to give us a fighting chance. A lot better than CEDA did us. But the Army? I could kiss the first soldier I see. They left us a nice little gift on the roof. We loaded what ammo we could into our guns and into our pockets just as the first wave of zombies showed up. Fighting the undead had become pretty standard procedure. It was the damn special ones you had to watch out for. As if they were reading my mind, they began showing up. A tongue-tentacle wrapped around Zoey and began pulling her towards the edge of the roof. I aimed my shotgun for the pulled tight tongue first. One blast severed the nasty thing, freeing the young girl. My eyes followed the writhing appendage back to its owner, but he was out of range for my shotgun. I’d just tickle him if I tried shooting. “Zoey, there!” I yelled, pointing toward the fleeing Smoker. She trained her rifle on the wheezing freak and sent him packing in a cloud of ash. Zoey gave me the thumbs up and turned her attention back to the zombie horde. The ground began to shake. The whole building began to shake. I ran for the chain gun. Louis began peppering the massive beast with fire from his assault rifle. We encountered one of these things before and it was hell to put it down. The chain gun should help that. I reached the chain gun and grinned as I launched lead towards the monster. The towering mass of muscle seemed to absorb the bullets like lotion. The nagging thought in the back of my head saying the chain gun wouldn’t do the trick began screaming. I ignored it. The beast had its tiny eyes fixed on me. It ran, its giant arms pumping it forward like a gorilla on cocaine. The barrels on the minigun began to glow red, but I didn’t let off. The blinking light of a pipe bomb arced through the air and landed mere feet from the approaching Tank. It exploded, causing the Tank to stumble and fall. It fell to the ground and came to a sliding stop. I think we all breathed a collective sigh of relief. The sound of whirring helicopter blades broke the silence. 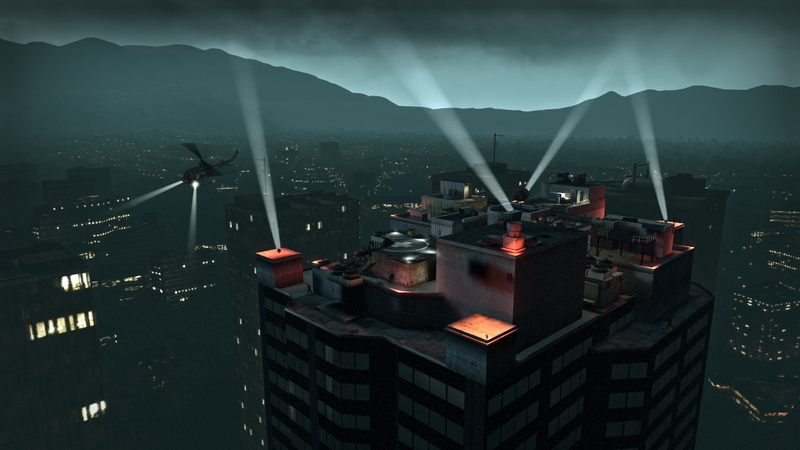 “Helicopter’s here! Everybody to the chopper!” Bill yelled. We all began running as more infected began to pile onto the roof. It was as if they knew rescue was here for us and they weren’t gonna let us leave. The building began to shake again. I watched as another Tank appeared and separated me from the group. I ran, away from the helicopter, away from the Tank. It was so close behind me I could feel its stench. There was loud wet smack as I felt my backside give in. The hit sent me flying through the air. Ten feet. Twenty feet. Thirty feet, until finally, I was away from the hospital roof, staring at the black streets below me. I am sure my back was broken. Everything hurt. It wouldn’t hurt for long though. The ground was quickly rushing up to put an end to all that. I stared at the computer monitor as it taunted me with the game over screen before the game reset and sent me back to the beginning of the level. I could not believe I just made it all the way through the No Mercy campaign only to die in the finale. And not just die, mind you, but to be FREAKING PUNCHED OFF THE ROOF! This was roughly what happened to me the first time I played Left 4 Dead. When I bought the game, it was relatively new and I’d never heard of it. I liked zombies and thought the description on the back of the game box sounded fun, so I decided to give it a whirl. And man, I’m glad I did. 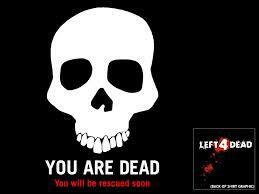 Left 4 Dead puts you in the middle of the zombie apocalypse with three other people. You must use teamwork and strategy in order to survive. The gameplay is basic: Get from Point A to Point B without dying. Repeat. That’s it. And as far as story goes, there’s a short intro video when the game boots up, but that’s it. While Left 4 Dead may not seem so concerned with story, it actually is. But rather than give elaborate backstory or thrilling cut scenes, it allows to the story to unfold in a different manner. It allows you, the player, to tell the story. And each story is different. Left 4 Dead has gameplay AI (artificial intelligence) called “The Director.” The Director will basically watch how you play the game and then adjust gameplay according to your style. Like to take your time and be stealthy? He’s gonna send a zombie horde your way. Breezing through the level pretty quick? Oh, here’s a Tank. Low on health? Try getting past this Witch in the narrow hallway. It is the Director’s job to make you sweat. Even though it’s the same game, same levels, you never really play the same game twice. You get to tell your own story. And then there’s the water cooler moments, or as I like to call them, “Holy Crap, did that just happen?” moments. Like the time a Tank punched me off the roof in the No Mercy finale. Or the time I accidently shot a car with a car alarm and alerted the horde. Or the time I snuck up behind a cowering Witch without alerting her and killed her in one shot. There’s all these cool little moments in the game that just add to the overall gameplay. For me, these are all about the story. It these “Holy Crap” moments that push us forward and keep us wanting more. With a simple backstory and awesome things to tell your friends about later (maybe near a water cooler), Left 4 Dead oozes with story. It may just not be like you’re use to. Hey everybody, here’s the audio of the first “episode” of CJ’s Story. I say episode, because I plan on releasing it free in that format and maybe in full (for a minimal fee?) somewhere else. Not really sure yet. Kinda veering into uncharted territory here. I have a little experience working with audio from a former job (editing audio for a church radio broadcast) so I kinda know what I’m doing, but there’s a lot of technical stuff I don’t. The plan is to teach myself the ins and outs of audiobooks with CJ’s Story, then tackle the bigger novels. I don’t know, we’ll see. You’re on this crazy ride with me! Anywhosen, give this a listen and let me know what you think! What do you think about the music? Is my intro/outro voice cheesy? How do you like my reading?